For sale by online auction: Terms and conditions apply. 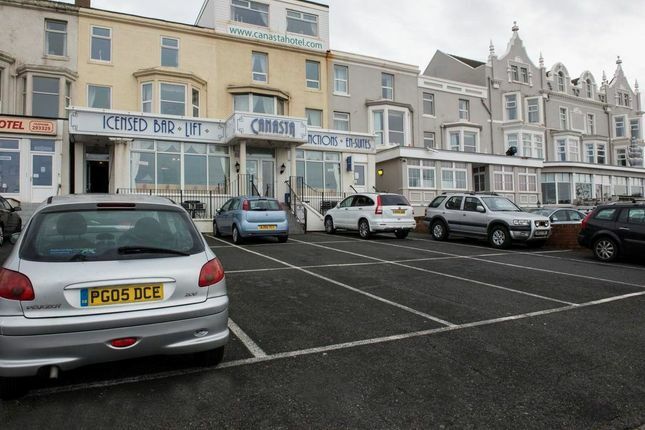 We are pleased to offer to auction the opportunity to purchase the freehold and business of this substantial 30 bedroom hotel, fantastically located in a prime position along Blackpool Promenade. Spanning five floors, the hotel benefits from a lift, large bar and dining areas, full commercial kitchen and car parking spaces for 20 vehicles externally. The current owner bought the hotel in 2001 and 2002 as two separate buildings, and developed into one large property; the buildings still retain their own separate utilities, so have potential to be converted back into two if preferred. The Canasta Hotel boasts excellent online reviews with regular repreat visitors, and has all fixtures and fittings included within the sale. The property is in excellent condition throughout and should be viewed to be appreciated. The property is excellently situated in a prime position along Blackpool's famous Promenade. Specifically, the property is located in North Shore, Blackpool, on a busy commercial street. The property is a 15 minute walk from Houndshill Shopping Centre plus lots of other popular retailers, including Primark, Costa Coffee, River Island, Boots and many more. It's also less than a ten minute walk from Blackpool North train station, providing ease of access for tourists. Rooms 1-18 are serviced by the lift. There is an attic room on the third floor (without lift access) which is currently used personally by the owner. The basement measures approximately half the area of the main hotel, and is used for beer storage and laundry purposes. The property is registered on two titles; both titles are freehold. Title numbers are la North Promenade) and la North Promenade). The adopted rateable value is 27,000 as of 1st April 2017. For further information please contact our office direct on , or alternatively via e-mail on . With regards to viewing the subject property, this is to be done strictly by appointment through Keith Pattinson Commercial department. Please contact us to arrange an internal inspection, or to register your interest. Property descriptions and related information displayed on this page, with the exclusion of Running Costs data, are marketing materials provided by Pattinson - Commercial, and do not constitute property particulars. Please contact Pattinson - Commercial for full details and further information. The Running Costs data displayed on this page are provided by PrimeLocation to give an indication of potential running costs based on various data sources. PrimeLocation does not warrant or accept any responsibility for the accuracy or completeness of the property descriptions, related information or Running Costs data provided here.